I once had the opportunity to hang out with Daniel Martinez in Tijuana during inSite05, he’s an amazing person, charismatic and smart and generally I’m a fan of what he does and has to say. However this show I hated. It was boring and not compelling at all. 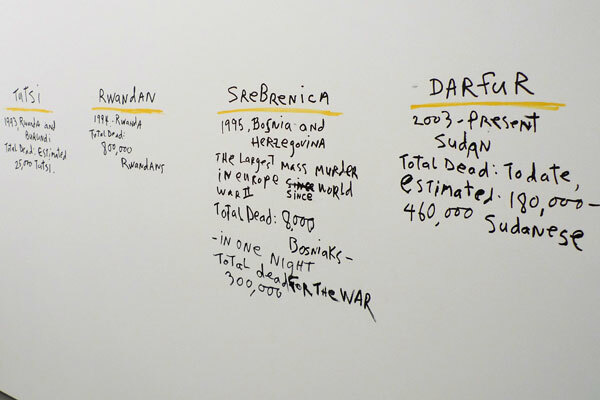 The text and numerical figures of human carnage painted on to the walls of the gallery are blunt and sad realities of humanity, but the display fails to do anything, even hit the viewer over the head, which I think is what Daniel is trying to do. Putting this stuff inside of a commercial gallery is simply silly, stupid and claims the viewer as ignorant. 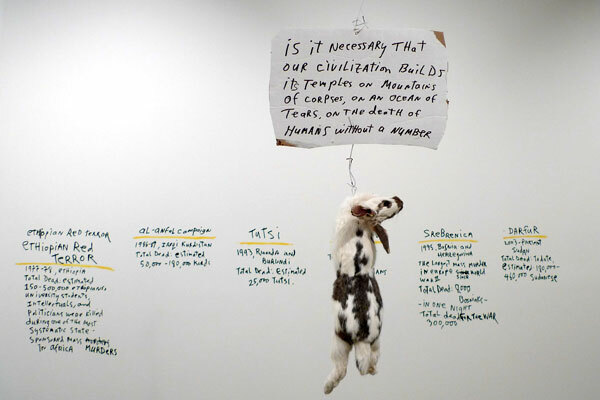 If an artist is really going to try to use a commercial gallery as a platform to declare outrage at human carnage, then do something with it. This show does nothing. Or perhaps the gallery sold some of the work and they made $$$. 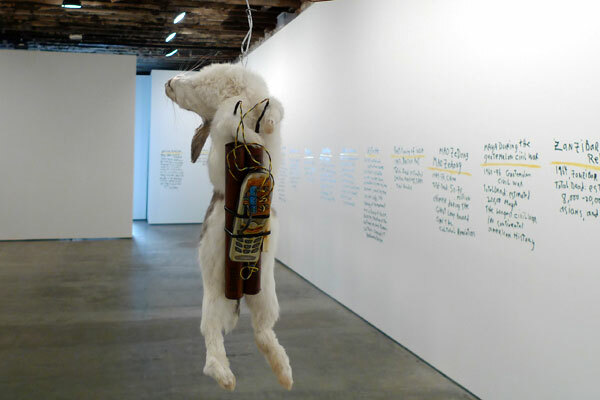 I kind of liked the hare bomb, could be a compelling symbol in a more interesting installation. Last Saturday on my way to Conflux, I stopped through a few galleries in the Bowery / Lower East Side, it’s crazy how many there are now. 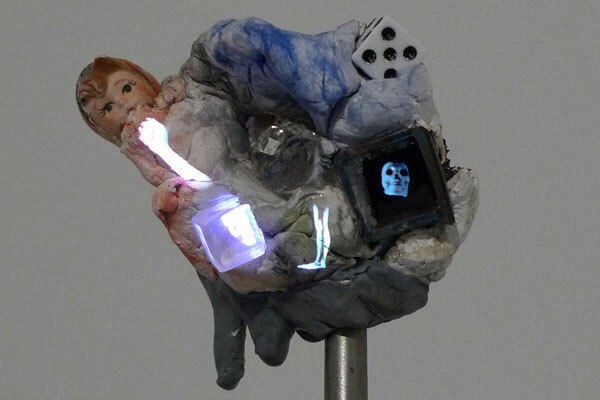 I don’t have much to say about Tony Oursler, he does what he’s been doing for a long time now. I think the pieces are fun and creative, but have low impact. 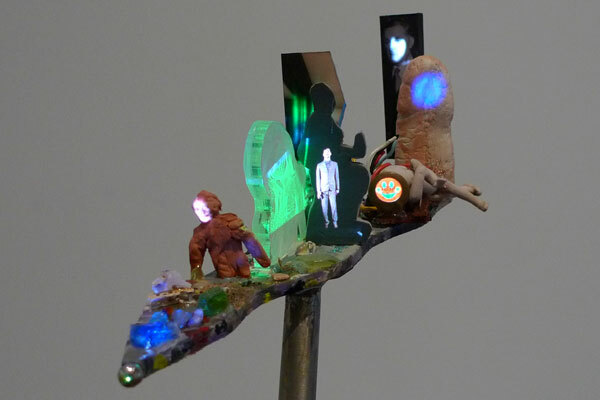 In his current show at Lehmann Maupin he takes advantage of the new tiny video projectors to create whimsical vignettes. The presentation is minimal, but the works themselves are not. I plugged my camera into my computer to download a few recent images and found a ton of images from the past two months that I’ve ignored, so I’m putting them all up today, starting with a few from the Maker Faire at the New York Hall of Science from September 26th. I’m not sure who would ever want this thing, perhaps a corporate lobby or some entity that wants to make sure that you know you are being watched. 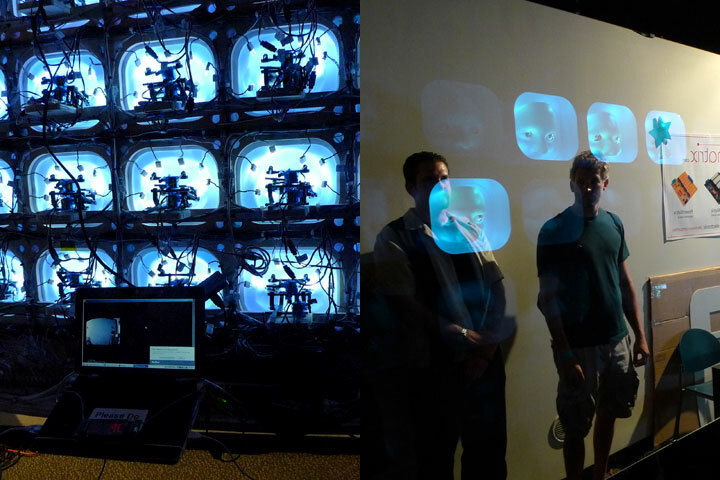 This over the top giant mirror had embedded masks with robotic eyes that were being controlled by webcam vision software. 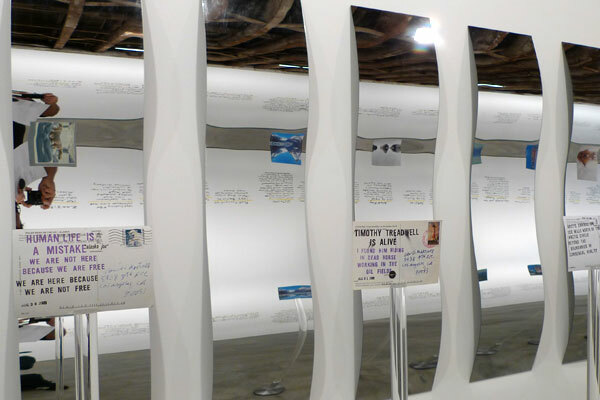 Above is the back of the mirror on the left – a whole lot of servos and on the right is the front of the mirror with the masks and the reflection. They were advertising Mondomatrix. 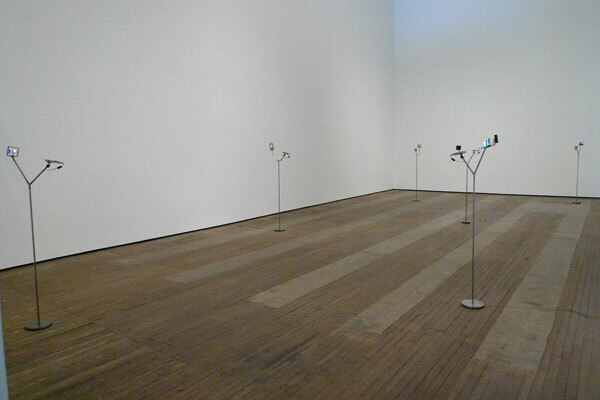 Another cool but pointless interactive sculpture/display – designatum by Muhammad Hafiz. 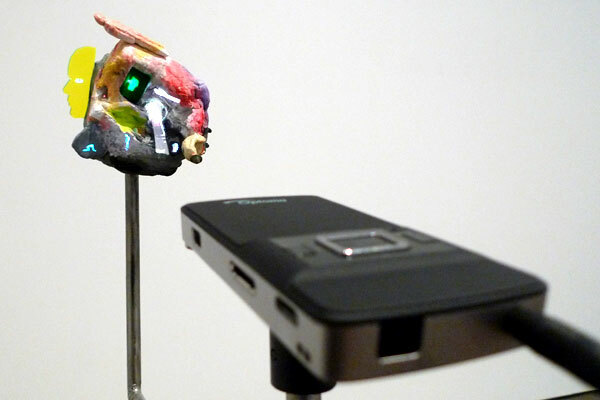 It’s more of a display, because it doesn’t have the creative framework to call it a sculpture. 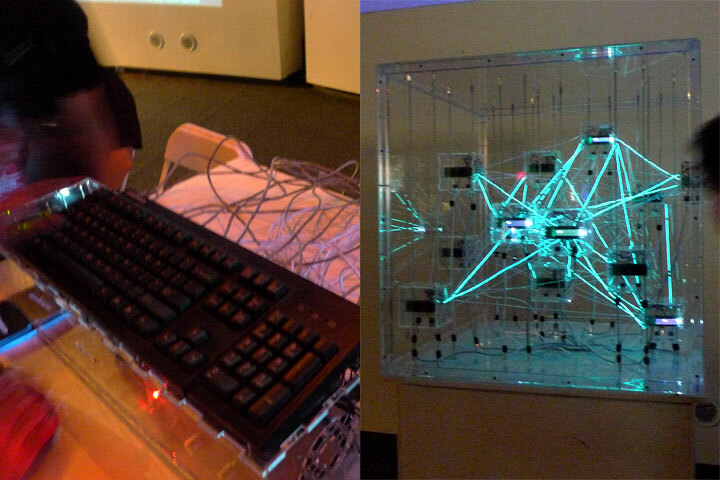 People can type into a keyboard that is wired up to a matrix of LCDs and see their message show up between the various LCDs. The project is titled I felt as if I was at a ITP open house. ArcAttack at Maker Faire, NYC 2010, pretty cool spectacle. 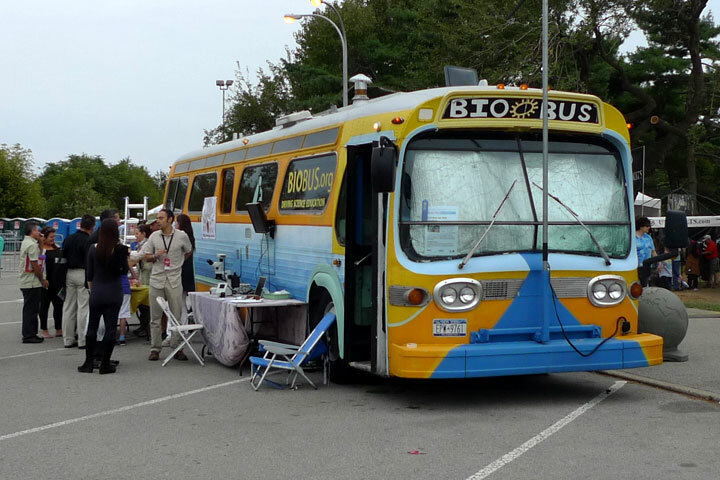 Amongst my favorite things that I cam across is the “mobile science laboratory” BioBus. Studying biology inside and outside. 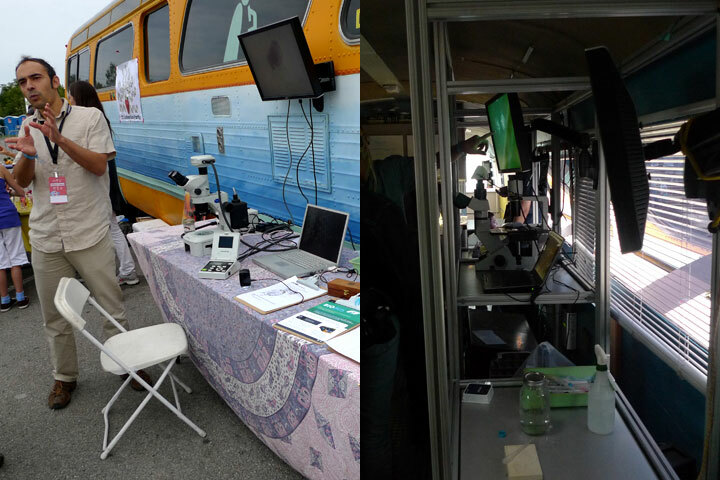 The bus is geared up for lots of microscopic lessons. 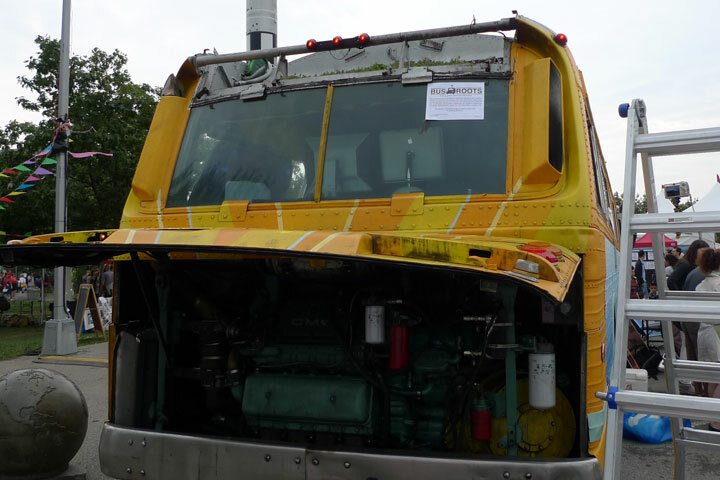 And lastly, the cool roof top garden on top of the bus (you can just see the green tips), presents a proposal to the MTA to plant gardens on all NYC buses, or better on all buses world wide, to help the air quality. If there is a revolution in public practice happening today it is not in a conference at a private art college. Revolutions in practice can not be captured and summarized at a conference. The very notion of Creative Time Summit conference runs against “revolution,” “public,” or “practice” and mutes anything powerful or inspring about these terms, simply because it is curated and caters to a particular audience. In many ways it is a closed session. And the term “Revolutions in Public Practice” reads as hyperbole in the context of an art elite conference. I was at a round table discussion at Conflux today and afterwards headed to a Lower East Side Bar to meet a bunch of friends who had been at the Creative Time Summit. Once there, I asked people how the Summit had been and it was the usual conference response… what’s the point? why are we here? it was the usual conference scenario… The usual reactionary responses to a conference. And my response to people is do not be duped by the catch terms “revolutions,” “public,” and “practice” as well as “summit” and “creative time.” This is my problem with such a title, it is not revolutionary or public, so please don’t misuse these terms; these terms have already lost so much meaning or power. Most of the people I spoke with didn’t go the second day, rather they tuned in and out from home. 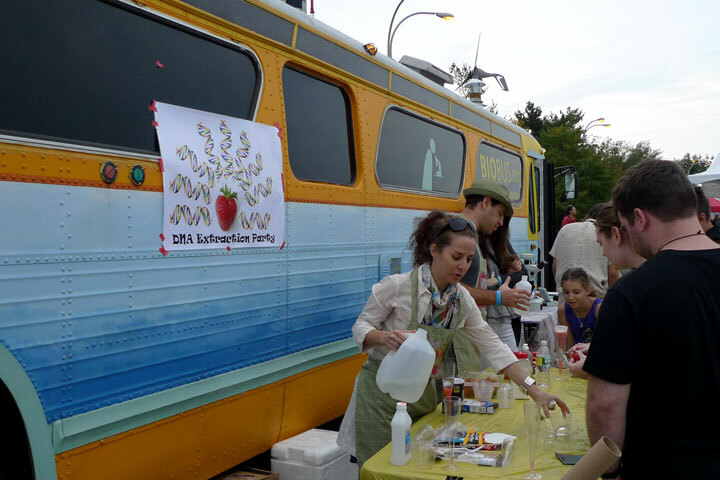 Creative Time Summit is however an exceptional moment to network and hear a summary of evocative creative ideas and briefly exchange perspectives with like-minded individuals. Sadly people buy into “The Creative Time Summit” as if it is a revolutionary agent, but it’s just another conference, put on by another institution that is far removed from anything revolutionary – whatever meaning that term can carry in relation to contemporary art that is safely nested in Western networks of capital.